Mike Hawkins, Fisheries Management Biologist for the Iowa Department of Natural Resources, issued an update this week on the Asian carp situation in the Iowa Great Lakes. The commercial angler has been keeping our office updated on catch each day they work on the area lakes and are required to provide all catch records for the season. The commercial angler has been sensitive to the situation and has been providing us with very timely updates. The numbers of Asian carp being caught at the Narrows on East Okoboji Lake by the commercial angler are heading in the right direction. This is one species’ catch where we like to see diminishing returns. There is little known of their tendencies and habits in a large natural lake. We don’t know how they are distributed, if they are schooling, concentrating in certain areas, or if these tendencies with change seasonally or from year to year etc. With only repeated seine hauls in the same location at the Narrows, the numbers in the net tell us surprisingly little about the situation. Our local staff is working with our own in-state experts along with regional and national experts to explore ways to learn more about the population of Asian carp in the Iowa Great Lakes. We have discussed radio tagging these fish, but tagging and releasing a silver carp and then having it land in someone’s boat, potentially injuring them, is not an option for us. Any and all Asian carp collected will be removed from the lake. As time goes on and more seine hauls are made and other sampling is done we will learn more about these fish. During this year’s walleye and muskie broodstock collection efforts, 9 state crews netted 8 nights on Spirit Lake, East Okoboji, and West Okoboji. Each night, each crew set 3 – 320 foot long by 8 foot tall entanglement nets (over 200 net nights of effort). Our objective during this effort is to collect adult walleyes and muskies, but these nets have been shown in other studies to capture bighead and silver carp. In all of that effort, 3 silver carp were collected on East Okoboji Lake. The three fish were caught near Stoney Point and Parks Marina. In addition, our research team has been on the lakes electrofishing for 6 days this spring and have shocked along shorelines on the lower chain, main lakes, and canals. They have not sampled or seen any Asian carp. Silver carp are very sensitive to electrofishing and will exhibit their jumping behavior readily if they are near one of these boats. This effort is continuing. Over the next two weeks we will be assisting the Aquatic Invasive Species team from Boone on sampling efforts in the Little Sioux River. 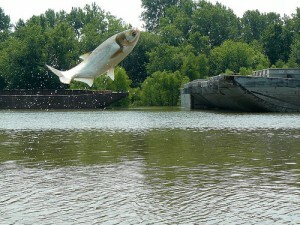 We will be looking specifically for Asian carp. Again, we believe nearly all of the Asian carp that migrated up the Little Sioux River from the Missouri River that didn’t get into a lake retreated back downstream last fall as the river levels fell. Our sampling on Milford Creek and the Little Sioux River last fall confirmed this, but we will do extra sampling this spring to make sure. Low water levels will make this effort difficult. We are exploring a temporary physical barrier system on the Lower Gar dam as a way to provide some protection between now and when the electric barrier is constructed this fall. This may seem like an easy task, but after meeting with contractors with some experience in these systems, we keep running up against the same problems: constructing a barrier that is strong enough to hold up to the massive pressures associated with moving water, and at the same time not adversely impact the ability of the weir to convey water. Any physical barrier placed at the weir will plug with vegetation and other material and we need to have a plan in place to keep the system free of debris, especially during the unlikely event of high water like we experienced last summer A strategy to keep a barrier clean during high water presents a logistical problem and a risk to the person/s tasked with keeping it clean. We are continuing to aggressively explore options. Over the past few years and especially in the last few months we have been communicating with a number of biologists, engineers, and researchers specializing in Asian carp and fish migration. Below is portion of some recent correspondence with Duane Chapman with the USGS in Columbia, Missouri. Duane is one of the nation’s foremost experts/researchers on Asian carp. Duane’s statements reassure us that we are on the right track. The life span of these fish is very great, probably over 20 years, and so the numbers will dwindle slowly. All of the fish that have been caught so far in the lakes, except for one 10 pounder, are probably only 1-2 years old (we took body structures from the fish so we can age them – those results should be available shortly). They quickly outgrow any predators and will likely have low mortality rates and live out a long and plump life in the lakes. We did make it through at least part of the recreational season last year without any incidents, which is encouraging. There is even anecdotal and circumstantial evidence to suggest that silver carp may not exhibit as much of the jumping behavior in a lake when at low numbers. The jumping behavior is a defense mechanism and with room to get away in the lake as opposed to a confined river channel they may not jump as much. It is possible that at low numbers the probability of incidence is simply reduced. Typically, the only way into a watershed is from the bottom, where water exits. Think of a watershed as a roof top and the watershed boundary as the ridge or peak. A fish swimming up would run out of water before getting to the peak. A fish would need a channel or notch to swim through to get from one side to the other. We’ve been working the Minnesota DNR extensively on the carp issue. As you can imagine, Minnesota is very interested in our situation and proposed solution. One topic of intense focus has been inter-watershed connections or diversion ditches. These ditches are that artificial channel that may allow fish to move from one river drainage to another. These ditches were dug long ago at the very top of some watersheds and maintained in some locations. They never accomplished what they were intended to do and have now been identified as problem. Although we don’t believe we have any in northwest Iowa (we’re using mapping software to patrol the watershed boundaries as I write), Minnesota has identified a few – none of which are connected to the Iowa Great Lakes watershed. That means there is only one way into our lakes – the outlet. From a larger perspective, the Minnesota DNR is being very proactive and attempting to close or have already closed inter-watershed diversion ditches between the watersheds of the Rock River, Little Sioux River, and Des Moines River. This will, in effect, keep these fish from doing an end-around on us. Please be assured a significant amount of effort at the local and state level is being brought to task on the Asian carp issue in the IGL’s and there are a number of things happening behind the scenes to make sure we’re doing all we can. Our staff in Des Moines have been working hard to compress the permitting, engineering, construction, and approval schedule of the electric barrier as much as the law will allow. It is also important to move through these steps methodically. Electric fish barriers are complex devices and new for us in Iowa. We have been talking with other agencies that currently operate them and making sure we are preparing ourselves for design, construction and operation. This is a major construction project that we need to do right the first time. My office will be tasked with its operation and maintenance so there is no one more sensitive to its ease of use, maintenance requirements, and operational safety. Below is the DNR’s working schedule. Our staff continues to try to look for ways to shave days off this schedule so these dates are likely to change. Internally, we must allow time for contract writing and legal review. Externally, we must allow the prospective contractors time to work, respond, and have dialog with our staff, especially during the engineering phase. The current schedule should be ideal from a construction standpoint with our highest probability of low water in the fall. Water flowing over the dam presents an expensive challenge for construction. Thanks for your support and please don’t hesitate to ask questions or pass this information on to other interested folks.I’ll try to pass along updates as they become available.